For some frequent flyer program participants, the primary goal isn’t to earn miles or free trips. Rather, their focus is on reaching elite status and reaping the associated rewards. As the name implies, it’s not for everyone. Entry-level elite status is typically earned after flying 25,000 miles during a calendar year, with higher-level tiers reached at 50,000 miles, 75,000 miles, and more. For most, the key benefit of earning status is upgrades to first class, an especially meaningful perk when the coach cabin is packed. Because of its exclusivity, and because elite status is meant to reflect and reward a customer’s loyalty specifically to the airline, elite-qualifying miles are generally awarded only for flying. And they’re awarded sparingly—i.e., while bonus mile promotions are common, the airlines rarely offer extra elite-qualifying miles. Easier access to elite has always been a matter of some controversy, splitting flyers on either side of the elite divide into haves and have-nots. 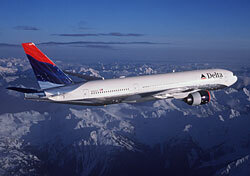 For those who would only qualify as elite because of a special offer like Delta’s, the promotion is obviously a plus. But for travelers who would attain elite status anyway, the addition of more elite members means more competition for scarce upgrades. So they’re understandably wary and resentful of promotions which swell their ranks. Ultimately it’s up to Delta to do the right thing: ensure that elite benefits are not degraded by the airline’s efforts to promote online booking.